Objective: Osteoarthritis (OA) is a disease of diversified etiology that causes the degeneration of the articular cartilage leading to proliferation of novel bone and reshaping of joint outline. A randomized controlled trial was conducted at the Department of Physiotherapy, Mayo Hospital, Lahore, to examine the effects of manual therapy training and neuromuscular training on knee OA. Materials and Methods: We conveniently selected a sample of 58 patients and placed into two groups. Manual therapy was applied in Group A and neuromuscular training in Group B along with conventional physiotherapy for 4 weeks. Results: The goniometry, visual analog scale, and Western Ontario and McMaster Osteoarthritis Index for knee OA were assessment tools to assess all the patients before and after 2 weeks of physical therapy intervention. Patients in Group A showed marked improvement as compared to Group B (P>0.05). Conclusion: The manual therapy group shows better results in improving pain and reducing physical disability. This study concluded that manual therapy had a more positive impact in improving pain, range of motion, and function as compared to those patients who were treated by neuromuscular training. المواد والطرق: تم اختيار مريح لعينة من 58 مريضا وضعت في مجموعتين. وتم تطبيق العلاج اليدوي في المجموعة أ والتدريب العصبي العضلي في المجموعة ب جنبا إلى جنب مع العلاج الطبيعي التقليدي ولمدة 4 أسابيع. النتائج: كان قياس الزوايا، مقياس التناظر البصري، ومؤشري غرب أونتاريو وما كماستر لاتهاب الركبة هم الأدوات التي استخدمت م لتقييم جميع المرضى قبل وبعد أسبوعين من التدخل العلاج الطبيعي. وقد أظهر المرضى في المجموعة أ تحسنا ملحوظا مقارنة بالمجموعة باء (P> 0.05). Osteoarthritis (OA) is a disease of diversified etiology that causes the degeneration of the articular cartilage  that is affected by short- and long-term abuse from normal wearing away, aging, overweight, and the trauma to the joint, leading to proliferation/spurring of novel bone and reshaping of joint outline. OA affects 16% of adult population >45 years of age, of which knee OA was the most common type, it affects nearly 6% of all adults., Knee OA is among the extremely frequent rheumatic disease in the Asian continent. Knee OA is a widespread state targeting muscles and skeleton distressing majorly female population and the elderly leading to long-term disability and poor worthiness of living. As this disease causes extended limitation in bodily functions, it is putting a society's health system under considerable financial load. It approaches in a progressive fashion. The high-flying factors related to knee OA are lower limb physical limitation, social complex, body mass index, and interval of disease. The specific chronological features related to OA are pain at the beginning of movement and during an activity, permanent pain or pain at night, need for painkillers to resolve unsettling pain, loss of function, stiffness, limitation of range of movement, halt in everyday activities, need for external supporting devices, and other symptoms (crepitating joint, enhanced sensitivity to cold, and gradual progression). OA is comprised of many diverse factors such as many universal factors (aging, gender, hormonal contribution, heredity, and nutrition) native joint predispositions (bony problems, preceding damage, loss of muscle strength, misalignment, and slackness), and many external factors (definite demanding jobs, explicit deleterious actions in daily life, and increased weight). Signs and symptoms exhibited by osteoarthritic patients are pain, tenderness, joint stiffness, loss of range of motion (ROM), grating sensation, and bone spurs. The existing medical literature has major focus on the release of symptoms, as to date no authenticated solution for the disease has been identified and no restorative intervention seems to be available in the near future, so it is of profound value to halt the onset and course of disease so that it can be prevented. Some important steps can be adopted for betterment of knee OA such as adjustment in one's lifestyle, control of weight, exclusion of damaging influences on the knee, and wearing of comfortable shoes. A wide range of conservative and nonconservative management for knee OA is depicted in the medical review. In the recent times, exercise is suggested as the most important management in knee OA., The main aim of treatment of OA of the knee is aimed at dipping joint pain and tautness, conserving and enhancing joint ROM, reducing physical limitations, enhancing well-being of the individual, preventing the succession of joint injury, and awarding individuals about the state of disease and its self-management. Physical therapy intervention is equally important in the management of knee OA including the various mobilization techniques, weight bearing and nonweight bearing exercises, soft-tissue mobilizations/manipulation, and various stretching techniques. This study intends to provide an opportunity to provide evidence whether manual therapy or neuromuscular facilitation is a superior way to deal with symptoms associated with OA. It was an randomized controlled trial conducted in the Department of Physiotherapy, Mayo Hospital, Lahore. A total of 58 individuals were incorporated in the study and two groups were made, 29 in each group. Participants were randomly selected through coin toss method. The inclusion criteria were patients with knee OA visiting Physiotherapy Department of Mayo Hospital, Lahore, for treatment, patients diagnosed by X-ray or magnetic resonance imaging with knee pain, patients between the ages of 40 and 60 years, and those willing to be part of the study. Moreover, patients with serious associated diseases, patients who had been undergone knee replacement surgery or unconscious, and those with the cognitive problem were excluded from the study. After obtaining informed consent from the patients, data collection was done through a questionnaire on demographic information and assessment (pain, stiffness, functional activities, quality of life, and ROMs) for knee OA. Assessment was done pretreatment and after 4 weeks of follow-up by self-evaluated pain, joint-related adverse effects, and progression of training. After baseline treatment of 10-min hot pack and five repetitions of Quad sets, Group A received manual therapy treatment (the stretching technique of identified shortened muscles surrounding the knee joint and mobilizations of the knee joint and patella) and Group B received neuromuscular training having a warm-up, circuit series, and cool down period. The first period was having 5-min mild stretching exercises of the lower limb as per patient agreement. The circuit exercise had closed chain exercises as a step up and step down, high knee, chair stands by support, mini squats against a wall, and heel rises. One or two open chain exercises had also been added such as straight leg rising. Each exercise was performed 2–3 sets, 5–10 repetitions. The exercises were performed with both the affected legs. Lastly, in cooling down period, 5-min lower extremity stretching exercises were performed. At the end, home exercise program was also given in the form of functional activities (hip flexion, Hamstrings curl, sit to stand, double leg bridging, and side lying leg lifts). Follow-up was asked after 4 weeks and at the end of treatment, patients were asked to fill again the posttreatment questionnaire. Data entry and analysis was done using SPSS 21 (SPSS for Windows, SPSS Inc., Chicago, IL, USA). Quantitative variables were presented using mean ± standard deviation. Qualitative variables were presented using frequency tables and appropriate graphs where applicable. P < 31.05 was taken as statistically significant. A t-test was used to determine the difference between the two groups in all clinical parameters both before and after treatment. A total of 58 patients were included in the study and mostly were females (69%) and the average age of the patients was 51.79 years [Figure 1]. The mean value of pain intensity on the visual analog scale (VAS) was 6.4 before treatment in Group A (manual therapy group). After treatment, the pain intensity on VAS reduced to 3.5 (<0.05). In Group B (neuromuscular training group), the mean value of pain on VAS was 6.4 before treatment. After treatment sessions, the pain intensity on VAS reduced to 5.2 [Figure 2]. The mean value of Western Ontario and McMaster Osteoarthritis Index (WOMAC) score prior to treatment in Group A was 60.9. After the treatment, the mean value of WOMAC score was 36 (<0.05). The mean value of WOMAC prior to treatment in Group B was 59. The mean value of WOMAC score after treatment in Group B was 46 [Figure 3]. 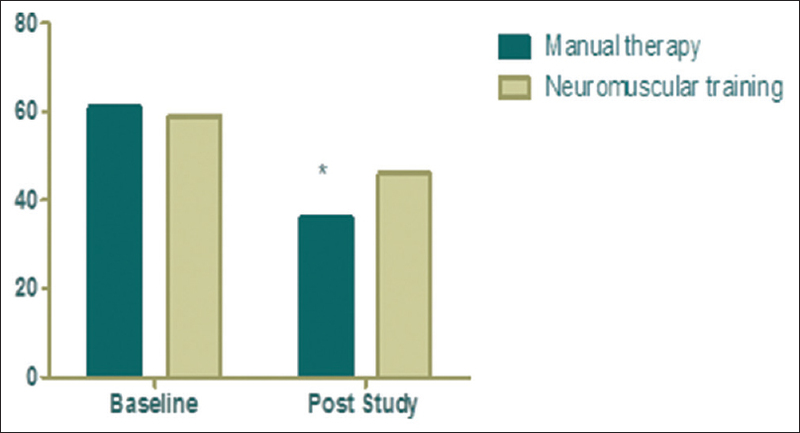 The purpose of the current study was to characterize the effectiveness of two techniques on the outcome of knee OA. In the recent times, some studies recommended that in end-stage knee OA, the chief contributors of self-reported disability were pain, obesity, and anteroposterior slackness of the knee joint, so the major focus should be on strength training. The effect of comorbidities on the health-concerned value of the living was also substantial. Therapeutic exercise is a variety of physical activity that is given according to the command of apposite professional health provider for desired treatment objectives. Regular physical activity is linked with lower transience rates for both older and younger adults. In addition, it is related to a declining risk for a wide range of disease and conditions. Knee OA is a mechanically driven disease. The knee joint load is predisposed by a practical alliance of the trunk, pelvis, and lower limbs with deference to the knee, as well as the ground reaction force implication on it while moving. As shown by some researchers that neuromuscular exercise can persuade knee joint load and diminish knee pain, it enhances the proprioception sense in joints by sustaining load in various weight bearing positions. From our research, we have found this therapy useful in knee OA as it showed P < 31.005; by analysis, we have found that it is helpful in decreasing posttreatment pain and WOMAC score and increasing ROMs. The manual therapy techniques were practical by the physical therapist in alleviating pain and enhancing ROMs mainly to the knee joint and accompanying short tissues. One justification for the manual therapy method in treating knee OA is that the condensed ache and tautness connected with the manual therapy approach enables patients to take part further effectively in the exercise regimen and daily living activities. The manual therapy passive movement approaches were practical to amplify digression in both intra- and periarticular structures when limited mobility was thought to be associated with the recurrence of symptoms or limitation in functional capacity. In our research, we have found manual therapy to be more useful as compared to neuromuscular technique as it unloads the joint and enhances the movement of synovial fluid in the joint cavity. This study concluded that manual therapy had shown greater improvement in mean differences as compared to neuromuscular training when analyzed through VAS, WOMAC score, and ROM. Larmer PJ, Reay ND, Aubert ER, Kersten P. Systematic review of guidelines for the physical management of osteoarthritis. Arch Phys Med Rehabil 2014;95:375-89. Mandelbaum B, Waddell D. Etiology and pathophysiology of osteoarthritis. Orthopedics 2005;28:S207-14. Jordan JM, Helmick CG, Renner JB, Luta G, Dragomir AD, Woodard J, et al. Prevalence of knee symptoms and radiographic and symptomatic knee osteoarthritis in African Americans and Caucasians: The Johnston County Osteoarthritis Project. J Rheumatol 2007;34:172-80. Andrianakos AA, Kontelis LK, Karamitsos DG, Aslanidis SI, Georgountzos AI, Kaziolas GO, et al. Prevalence of symptomatic knee, hand, and hip osteoarthritis in Greece. The ESORDIG study. J Rheumatol 2006;33:2507-13. D'Ambrosia RD. 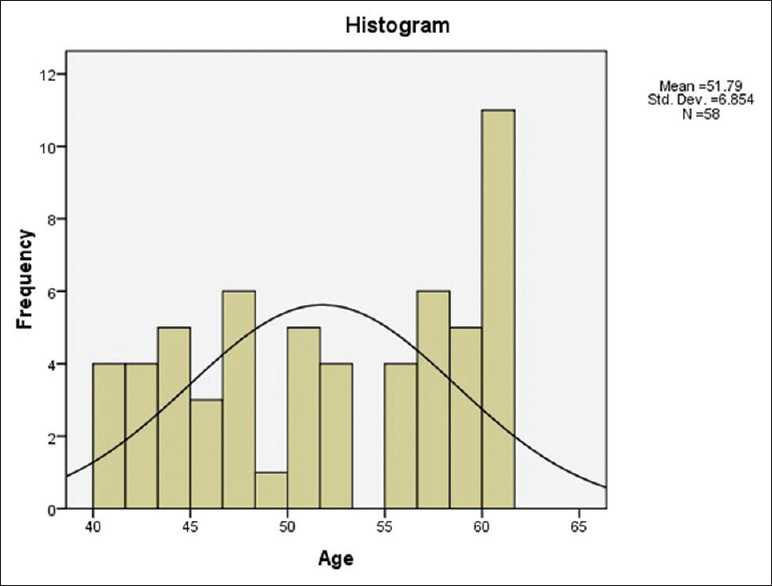 Epidemiology of osteoarthritis. Orthopedics 2005;28:s201-5. Zeng QY, Zang CH, Li XF, Dong HY, Zhang AL, Lin L, et al. Associated risk factors of knee osteoarthritis: A population survey in Taiyuan, China. Chin Med J (Engl) 2006;119:1522-7. Rosemann T, Kuehlein T, Laux G, Szecsenyi J. Osteoarthritis of the knee and hip: A comparison of factors associated with physical activity. Clin Rheumatol 2007;26:1811-7. Dieppe PA, Lohmander LS. Pathogenesis and management of pain in osteoarthritis. Lancet 2005;365:965-73. Garg V. Cost-effectiveness of Glucosamine, Chondroitin Sulfate, their Combination, Celecoxib, Non-selective Non-steroidal Antiinflammatory Drugs, and Placebo in Treating Knee Osteoarthritis: The University of New Mexico; 2014. Powell A, Teichtahl AJ, Wluka AE, Cicuttini FM. Obesity: A preventable risk factor for large joint osteoarthritis which may act through biomechanical factors. Br J Sports Med 2005;39:4-5. Zhang W, Moskowitz RW, Nuki G, Abramson S, Altman RD, Arden N, et al. OARSI recommendations for the management of hip and knee osteoarthritis, part II: OARSI evidence-based, expert consensus guidelines. Osteoarthritis Cartilage 2008;16:137-62. Kauppila AM, Kyllonen E, Mikkonen P, Ohtonen P, Laine V, Siira P, et al. Disability in end-stage knee osteoarthritis. Disabil Rehabil 2009;31:370-80. Fransen M, McConnell S, Bell M. Exercise for osteoarthritis of the hip or knee. Physiotherapy 2003;89:516. Deyle GD, Henderson NE, Matekel RL, Ryder MG, Garber MB, Allison SC, et al. Effectiveness of manual physical therapy and exercise in osteoarthritis of the knee. A randomized, controlled trial. Ann Intern Med 2000;132:173-81.